The lilacs suddenly came into bloom on Sunday. There was an electric current running silently from one bush to another throughout town and everyone agreed on a time. Suddenly, where there had been leafy green bushes, there were verdant high clumps of flowers blasting forth with their heady perfume and delighting the senses with their colors. Dark and intense purples, medium red-tinged purples of the French varieties, and the creamy whites, all are now blooming and making the city beautiful. It always amazes me that they are so wonderfully giving of themselves. I love lilacs, they are a sure sign of spring/summer, and their presence throughout our city just makes it even more beautiful. I had been in a bit of a rut story-wise, just working on revisions of my B2ME stories before I post them at my archives. But yesterday both LOTR Community and Teitho came out with their May challenges and they are interesting to me, so I'm back into thinking about fiction again. That makes me happy because I don't just want to concentrate on the research I'm doing for my November novel. Since I can't write anything on the novel until November 1st (according to NaNoWriMo rules) I can only research, establish characters and dialects in my head, and decide on my plotlines, etc. I am thinking quite a bit about that, but it will be a relief to have some other things to work on in the interim. Current Location: My desk is SO messy! I love lilac trees - I had one in my front garden but it died. I hate shopping as well, especially for clothing. It is a necessary evil as I am not confident enough, having lost weight, to order the right size. I order food over the net. It is still shopping but preferable to actually walking around a supermarket. I don't mind grocery shopping, just clothes shopping. If I need to I can get in and out of my local grocer in 10 minutes or less, but I like looking at the various food items. I don't buy very much, just look. Clothes, however, I just hate because most styles look horrid on me. What lovely pictures of the lilac - I haven't seen any out here, yet. I love lilacs. Thank you for those beautiful pics. I can almost smell them! They are so spicy-sweet and the blossoms are just precious. I adore them. I despise shopping for clothes. What I see in the stores looks terrible and not my style at all, and catalog shopping is touch and go. Plus I'm always short on money, but I will have to break down soon. Ick! When I'm not looking for clothes, I have a feeling that there is so much clothes in the shops and that they have everything; but when I'm looking for something specific, I often can't find it! Yes, trying on clothing is NOT one of my favorite things either. Well, I wear skirts and shirts/blouses, not jeans, but I do know what you mean. Comfort all the way! My DH wants to plant some roses. We had wonderful roses at our last house but couldn't bring them along when we moved. Clothes shopping? I have only one store I go to. I wait for a really good sale, then go in for no more than half an hour. Generally, that does it for me. We've got lilacs in the back, but they rarely bloom. I don't think they get enough sunlight. Still, around the neighborhood we've got several bushes. I love the pageant of spring with flowers coming out in succession. I planted several varieties of columbine several years ago (my favorite from Colorado), and now they've naturalized into all sorts of odd places. I found one yesterday, a purple one, growing through the bricks near the garbage can. You just can't stop life in the spring! I wish I could count on one store. I actually probably should just sew what I want, but again it's a time thing. I love to sew and I'm actually really good at it, but I just don't usually have the time to be able to spend at the machine. I love my lilacs, but they don't get enough light. If they got more light they would bloom much better. Ooh, lilacs. I love lilacs. ♥ Pretty pictures! I'm in more than a bit of a rut, writing-wise - more like a huge rut. Oi. It's no fun at all, and my confidence level is at negative six million as a result. 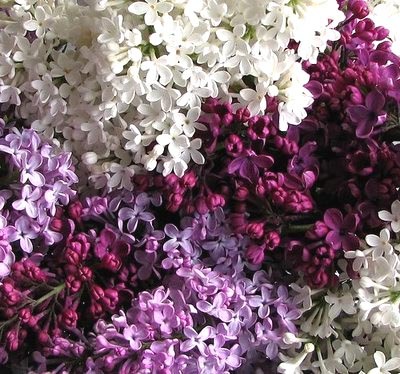 I love lilacs too, so I'm delighted that I brought some joy into your life today. Yay! Sometimes just having a goal or at least a mini-goal is all it takes to get the brain back in gear. 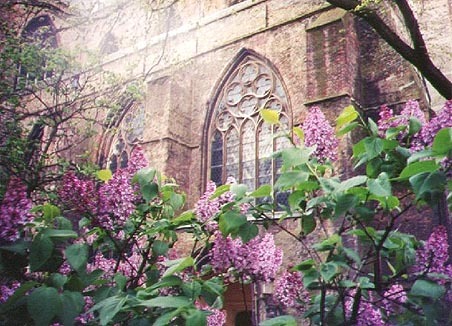 I adore lilacs. Of course, you're from the Twin Cities area so you are aware of how many lilac bushes are around the cities. Thousands, perhaps millions of them and every one of them wonderfully beautiful. I don't understand people who cut down beautiful things. Our next door neighbor cut down a tree that had been on our border front yard shortly after they moved in. We still refer to them as the 'tree killers'. Now...aren't you supposed to be doing some school work? Um yes, I mean no, that is to say.. LOOK, A DISTRACTION. I get most of my clothes off ebay! Ebay is a possibility I hadn't thought of. I may have to take a look.